SA=Salem (1 mile above city); SB=Salem (2 miles below city); WF=Wheatland Ferry; NE=Newberg (0.8 miles above city); OC=Oregon City (above and below Willamette Falls); PO=Portland (0.3 miles upstream of Sellwood Bridge). Figure 13-9 Spatial distribution of tolerant and intolerant benthic organisms in the Willamette River upstream and downstream of municipal waste discharges in 1945. Source: Dimick and Merryfield, 1945.
fish in or on the banks of the river, and a total absence of stoneflies and mayflies. They further noted that the biomass of insect larvae downstream of Salem was less than that upstream, and that largemouth bass collected below Salem were generally smaller than normal and in poor physical condition. Both of these conditions are indicative of poor water quality. Dimick and Merryfield attributed the poor biological condition below Salem to the effects of pollution, but it is uncertain whether fish were directly affected or whether their populations were diminished because of the lack of their invertebrate foodstuffs (Dimick and Merryfield, 1945). Regardless, the study demonstrated that pollution was a major factor in the decline of the river's commercial and sport fisheries. In 1983, the study was repeated to assess the changes that had occurred in the river since its cleanup began. Hughes and Gammon (1987) sampled the same sites that Dimick and Merryfield had sampled in 1944. Although the 1983 study showed some signs of a pollution-stressed river downstream from Salem, the differences between the findings of the studies demonstrated a marked improvement in water quality. Where Dimick and Merryfield had found only tolerant species associated with sluggish, warm water and muddy or sandy substrates, Hughes and Gammon found many intolerant species suited to fast-moving, cold water and rubble and gravel bottoms. 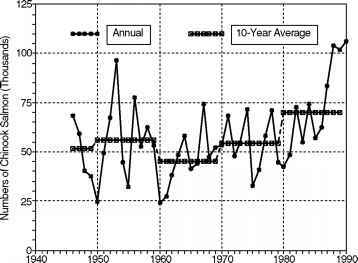 Figure 13-10 Long-term trends of spring Chinook salmon runs at Willamette Falls. 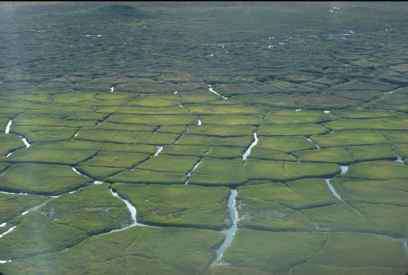 Source: Bennett, 1991.
spawning grounds. Corrections to this situation have accompanied water quality improvements. Fish ladders have been built at dams, and four large fish hatcheries have been put into operation, producing 3.8 million salmon per year (Bennett, 1991). The dams also provide flow augmentation during autumn low-flow periods, thereby providing faster moving, oxygenated water to running fall chinook salmon (Starbird and Georgia, 1972). Water quality has nevertheless played an important role in the survival and return of both natural-born and hatchery-reared salmon in the Willamette River. In 1965, only 79 chinook salmon were counted in the fall run. That number increased to 5,000 in 1971 (Starbird and Georgia, 1972). A record high of 106,300 spring chinook salmon were counted in the 1990 run, up 30 percent from the 1985-1989 average of 81,900. The 1990 catch of chinook salmon of 27,700 was 39 percent greater than the 1980-1989 average of 20,000 (Bennett, 1991). With the recent and continuing population growth in the Portland area (where most of the salmon are caught) and water quality improvements, interest in angling in the river has increased dramatically. The Willamette River is once again able to support important commercial and recreational fisheries.